XHORTATION SEEMS A hard word, but it simply means to strongly urge to good deeds, and this is what our artist shows Joshua to be doing. Joshua is now an old man, and the Israelites are settled peaceably in Canaan. He has called them before him, with their elders, and heads, and judges, and officers. 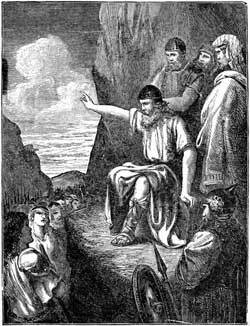 He tells them that he is old and about to die, and reminds them of the land that has already been conquered and divided among them, and of that which still remains to be conquered; urging them to be "very courageous to keep and to do all that is written in the book of the law of Moses, that they turn not aside therefrom to the right hand or to the left." He bids them take good heed therefore unto themselves, that they love the Lord their God; and warns them that if they go back and do wickedly, the anger of the Lord will be kindled against them, and they will perish quickly from off the good land which God has given them. In his address, Joshua said, "Ye know in all your hearts and in all your souls, that not one good thing hath failed of all the good things which the Lord your God spake concerning you; all are come to pass unto you, and not one thing hath failed thereof." How faithful is God! He never fails in His promises: and we are told He is unchangeable, so that whatever He promises now He will fulfil, and whatever warnings He gives will surely come to pass. How good is it to have this holy and wise God for our Father, and to know that He promises abundantly to bless all those that trust in the Saviour, Jesus Christ. But let us take heed of the warnings against sin given in God's Holy Word.